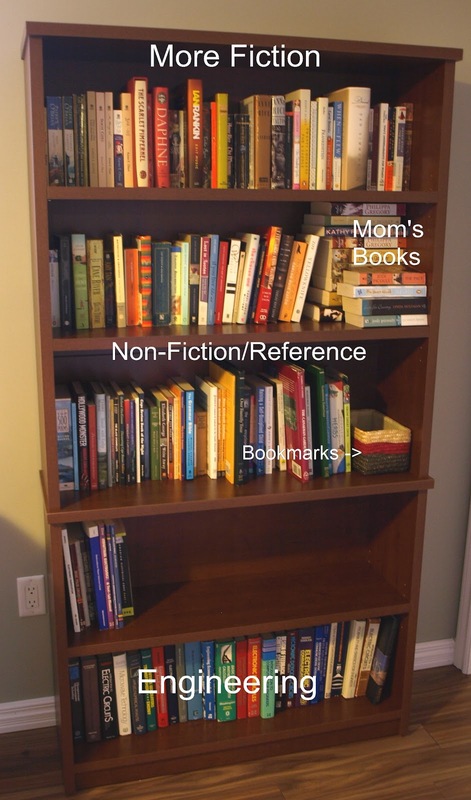 It took me months to find the perfect bookcases for my newly renovated basement but I did it! Weel, actually, my husband found these at Staples. We spent our Friday night putting them together. It was fabulous date night. No seriously. This is what happens when you're married 11 years. I should find us more projects to work on together. And next time wine. That would make things interesting. The organizing of the books was done by myself though. I had a plan and wanted no one messing with it. *See how nice I am. I left him a shelf for his engineering books. Your new shelves look fabulous! 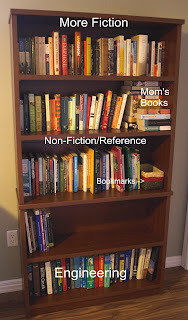 My books are arranged (in alphabetical order, of course) by review and non-review. Ooh! Pretty! I hink I love the idea of a system, but somehow I doubt that it would be very practical for me. Love your new shelves! You are way more organized than I am. I do separate review and non-review books, but that's about it. Beautiful!!!! And how kind of you to leave hubby a shelf. lol I need to reorganize my own books. 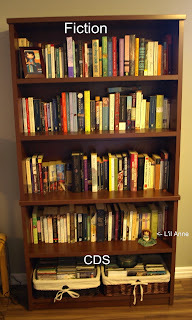 No more room for another bookcase, so they will have to go to Half-Price Books store or storage! Eeek! Sweet! I love new bookshelves, even though the fill up awfully fast. Strange how that happens. You are too cute! Love the new bookshelves. I am in desperate need of new ones as well. There is a huge anniversary sale at the local furniture store this weekend. I may have to check it out to see if I can snag any deals. I've only been with my boyfriend 6 years and putting shelves together already sounds like a perfect date night to me :P Love the look of yours! Leeswammes- It won't take long & they'll be filled again too. Kathy- I might change them to that yet. Nicole- This is new. We'll see how it works. Jessica- I have so many and I lose them all the time. I figured they needed a place. Suzanne- Luckily, he only has a few books. Anna- Talk to me in a few months. My systems work briefly. Andi- I hauled all my disgards to the used book store today. Michelle- Good luck! Hope you find some.